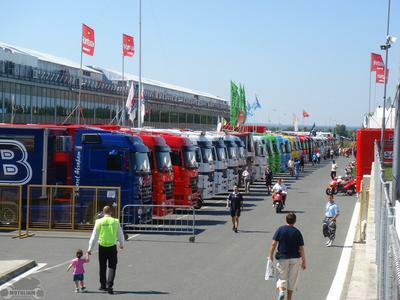 The Paddock in Brno. 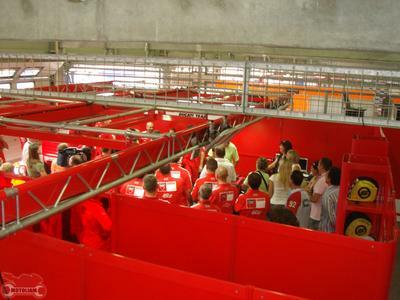 Actually, this is a small part of the whole circus, and everywhere we go in Europe, it's similar. Impressive. These trucks have criss-crossed Europe several times, and while I was "vacationing" in California, they were making their way through Spain for the Spanish Nationals. 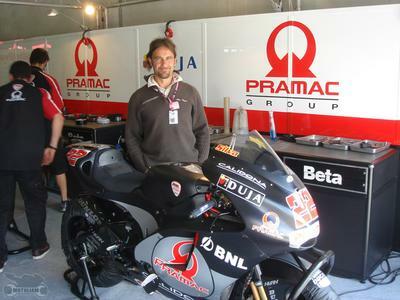 When they arrived in Brno, they were definitely in need of a scrub down. There were a couple of these jets divebombing the circuit, at least on two days. Sonic bombs a-plenty! They would swoop down and run along the main straight before cutting up and out and looping back for more. Name that fighter! 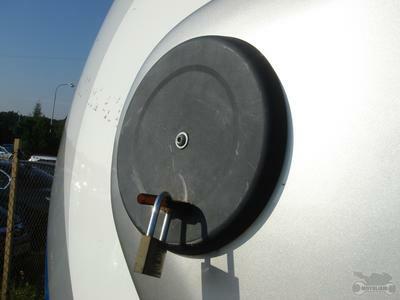 Now this is a positive helmet lock! Talk about the coolest trailer ever. 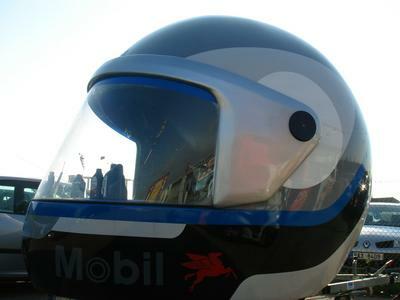 They were promoting and selling products from the front when the visor was flipped up. An example of how hard Ivan Silva (my rider this time around, as Alex Hofmann was substituting for Sete Gibernau again) rides. He managed to prevent a low side in turn one, and regularly gets an elbow down during practices and races. Watch out Spies, there's another guy your size that gets jiggy with the tarmac! My co-odinator, Luis Solano, models the goods. 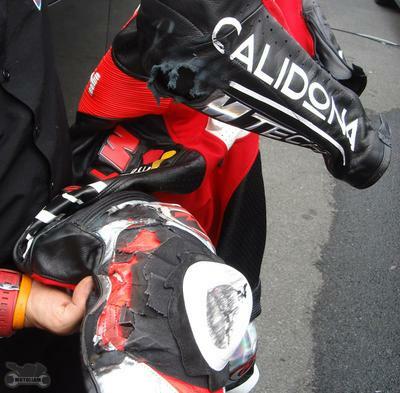 Why, yes, I would like elbow sliders with that! The levels of grip, even on Dunlops, are out of this world. 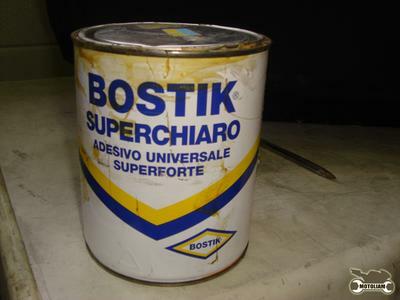 Can you imagine saving something like this? The bike never touched the ground! Tough to see, but the arrow is pointing at someone from Airwaves. . . . . . . This one is for you, Vince! 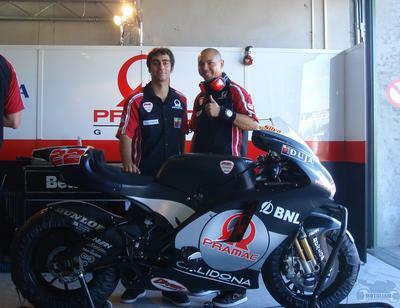 Say hello to Paolo, our assistant for a couple of the European rounds. We're always giving him a hard time, but deep down we know he's a good kid. Name that former World Champion! This girl had a couple of world champions of her own, haha. 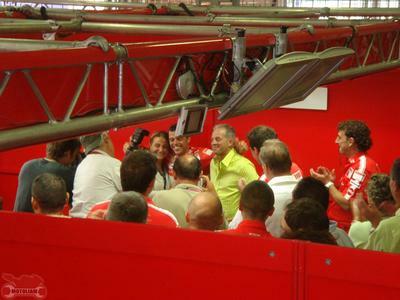 What a brilliant race for Loris Capirossi and Marlboro Ducati! After all the press conferences and trophy presentation, the entire team celebrated with cheers and clapping. I managed to grab a photo of the joyous occasion. Loris with his mother, "Go slowly, go slowly". What better way to celebrate than with a new toy? 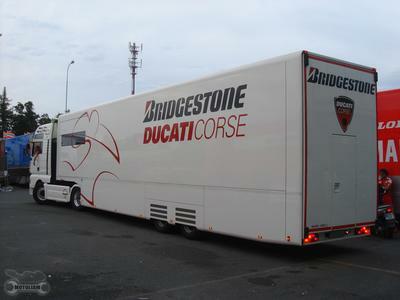 This rolled in late Sunday afternoon. . . . . .
Next up, Brno by night - and finally, food shots! 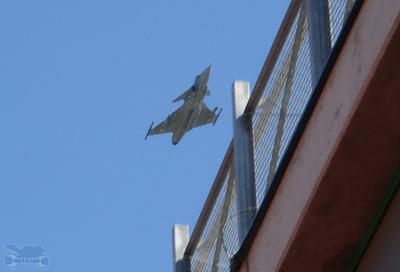 That fighter is a Saab "Gripen", which is a very impressive and modern fighter produced by the Swedes. A couple of cool things about the Gripen: it is Mach 2 capable, it was designed to operate off of very short runways, requiring only 800m to takeoff or land. Lastly it's cheap for a world class fighter at only $25 million a pop. 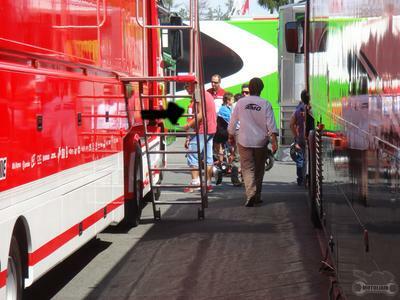 Great shots of the paddock life; keep 'em coming.